Bikes, slip and slides, watermelon, and snowcones! What do these all have in common? The TriSports.com inaugural 5th Saturday Ride. July 30 everyone is invited to join TriSports.com employees, local Team TriSports athletes, TriSports champions and the athletes of the TriSports Tri Club for a group ride. 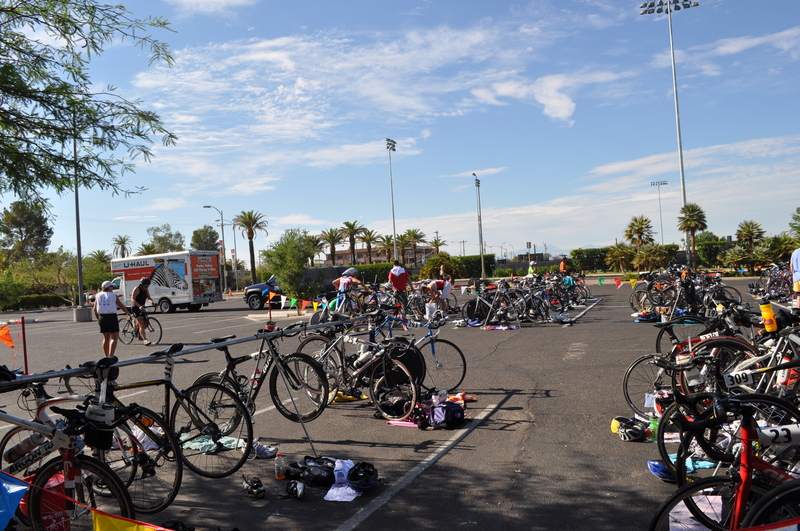 Everyone will roll out of the TriSports parking lot at 6am. Distances are as long as you want to go…the ultimate destination is Gates Pass/McCain Loop. The ride will be followed by cold watermelon, even colder snowcones and you can cool off in the inflatable slip and slide! Have your family and kids meet you at the end of the ride and join in on the fun! Hope to see you there! And don’t forget to use code BOLIV-S for 10% off any purchased goods you might need! 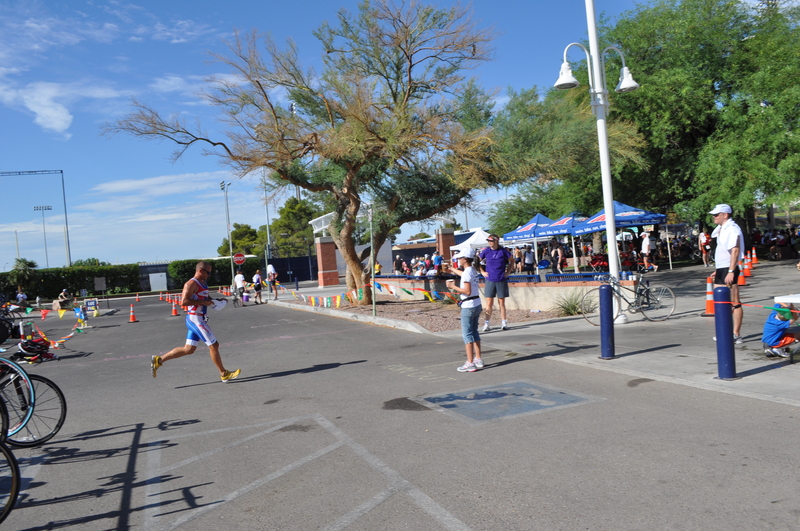 Today was the 17th annual Steelhead Triathlon at Ft. Huachuca (Sierra Vista, Az.). I awoke at 3am, ate a quick breakfast, got dressed and then hit the road. It is a 1.5 hour drive. I arrived at the race site at 5am. I picked up my race packet and then proceeded to set up my transission area. A quick review of the course maps was followed by a short warm up run. 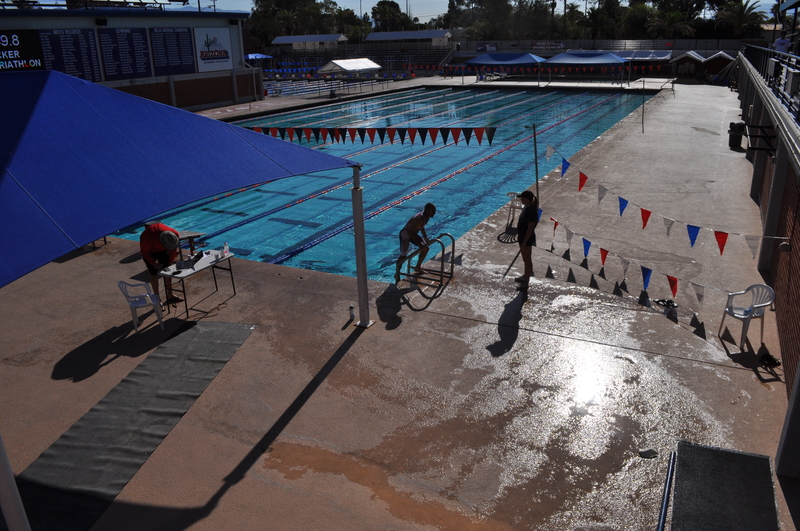 I then got in the pool for a few warm up laps. The weather was great. Cool and overcast but the humidity was high. 6am…race time. I was in the first wave along with all the other fast guys and girls. This pool is always a slow swim for me…there are no stripes on the bottom so you have to keep an eye on the lane lines. Today was no exception. I exited the 800 yard swim in about 12:45 and found myself in about 15th place. With a swift transission I passed 5-6 people. I then made quick work of catching people on the bike. I settled into my aerobars and set a strong pace. The course is a 12 mile out and back. The first half is rolling hills followed by a 1-1.5 mile steady climb to the turn around. 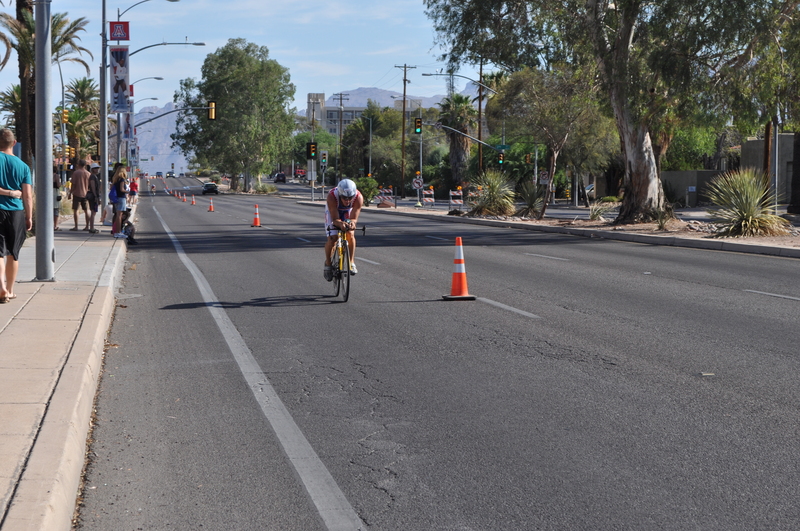 By the turn around I was in 5th place…3 individuals and 1 relay team in front of me. I was slowly making up time on the 4th place guy. I entered transission only a few seconds behind him. After another quick transission I was off for the out and back 5k run. The course is a slight downhill all the way to the turn around and then retracing your path back up the hill to the finish. I overtook 4th place within the fist 1/4 mile. My foot turn over was fast and I felt good. I saw 1st place and knew that he was out of reach. 2nd was a relay team so I wasn’t too worried about them. 3rd was a possibility but it would be tough. I was gaining a little time on him and had him within view but ran out of space. I crossed the line in 3rd overall with a time of 1:06:40. The awards were nice “crystal” trophies and were handed out by the base commander. 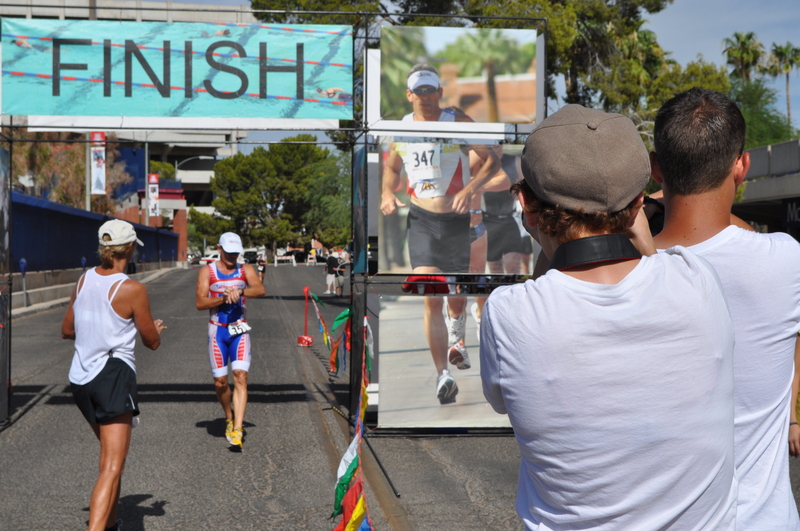 Now I have 2 weeks remaining in a 3 week mid-season break then the build up for Ironman Arizona begins. 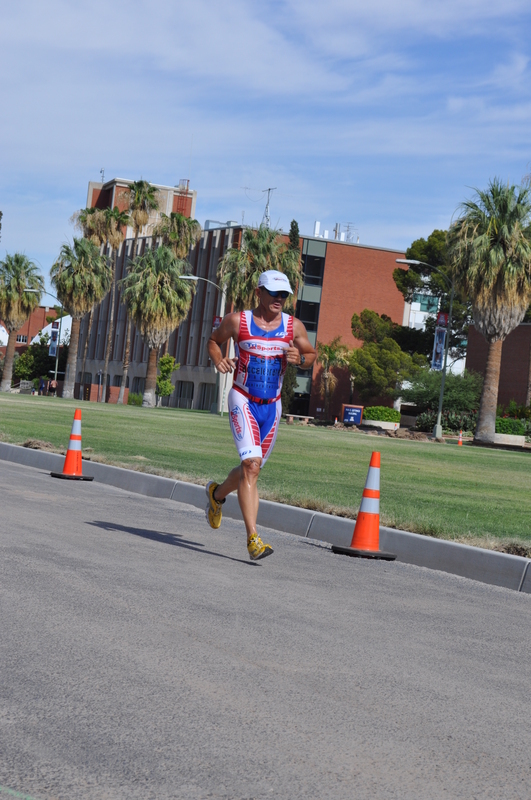 Sunday was the second race in the Tucson Triathlon Series…the Firecracker Triathlon. The alarm awoke me at 4am. A quick check of the tempature showed 83 degrees! With the desert monsoon season in full swing the air was also thick and sticky. After a quick breakfast of 3 Eggo’s I got dressed and jumped into my pre-packed Vehicross and made the 30 minute drive to the University of Arizona’s Hilibrand pool. Even though I arrived early there were quite a few bikes already racked. I found a good spot and set up my equipment. I then had a bit of time to waste so I caught up with a few old friends. A kids race was held prior to the adault event. I volunteered to ride the bike course with the kids. A great way to get in an easy warm up and recon the course. The 11 year old kid I rode with was a blast. While averaging about 16mph he took the time to wave to everybody along the course…police, spectators, people at the bus stops! He was having a great time! After that I went for a 10 minute warm up run and then got in the warm up pool for a bit. I was feeling pretty good. By now the temp was well into the 90’s and the humidity was well above the single digits we are used to here. 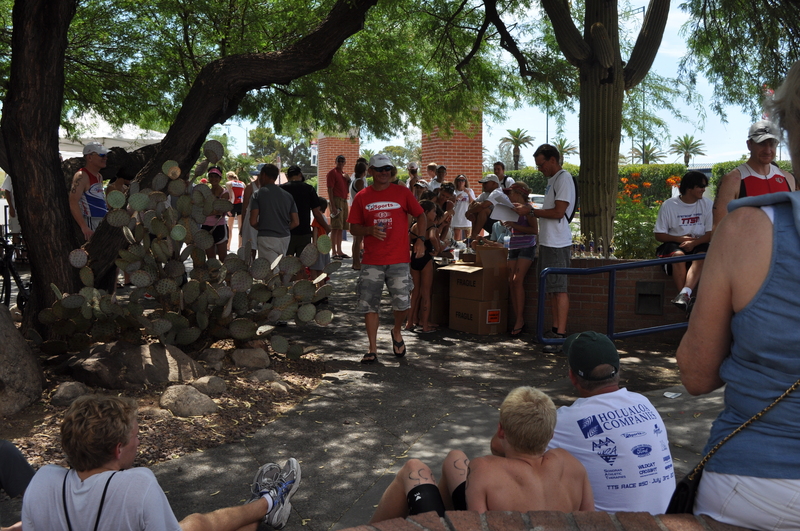 The swim was a serpentine swim with swimmers starting time trial style every 15 seconds. I had the “honor” of starting in the very last position. Lucky me! It was now time to race. The swim distance was 750 meters (long course). The starter gave me a 5 second warning and then GO! I quickly got into a smooth stroke. A few quick peeks into the lanes of those that started earlier let me know I was keeping a good pace. I focused on my stroke and counted down the laps. As the last to start I was the last to exit which would give me a lot of “rabbits” to catch. I exited the pool in 12:05…an 8 second improvement over last year and 32nd best of the day. I was off to a good start. Last to start...last to exit. Out of transition I quickly got my feet into my shoes and settled into my aero bars. The course is a 3 loop 12 mile course. The first 2 miles of each loop are slightly down hill followed by 2 miles of a slight climb 1 mile of which is full of bumps and pot holes. I was going strong and quickly began to catch and pass people. The first loop was a bit congested and I found myself calling out “left” a lot to get around the slower riders. By the second loop the traffic had thinned and i was able to focus on just going fast. My legs felt good the entire time. As I came down the final section I slippped my feet out off my shoes and prepared for T2. T1/bike/T2 combined time was 29:52…20 seconds faster than last year and 7th fastest of the day. T2 was again a fast one. 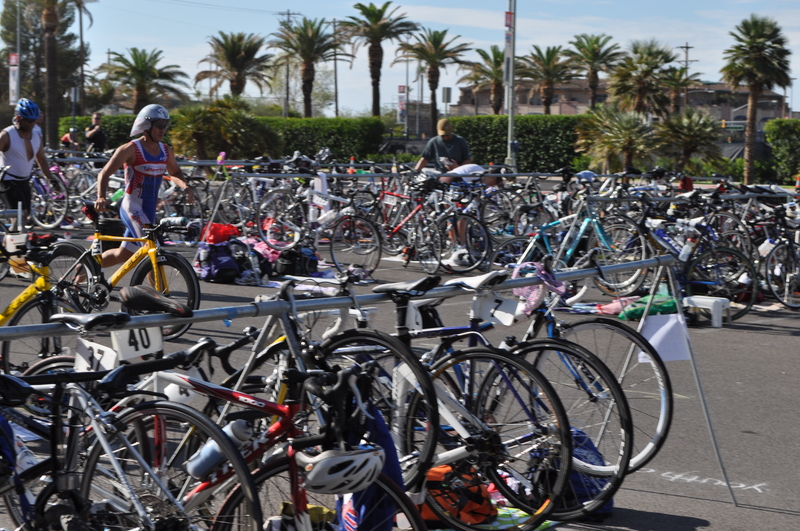 Rack bike, remove helmet, slip on the Fasttwitch’s, grab race belt, hat and glasses…run! I imediately felt the heat and humidity but my legs were feeling good. The run course is a short out section, 2 loops and then a short section back to the finish totaling 3 miles. As I turned onto the loop section the front runners had just passed through to start their 2nd loop…rabbits to chace. 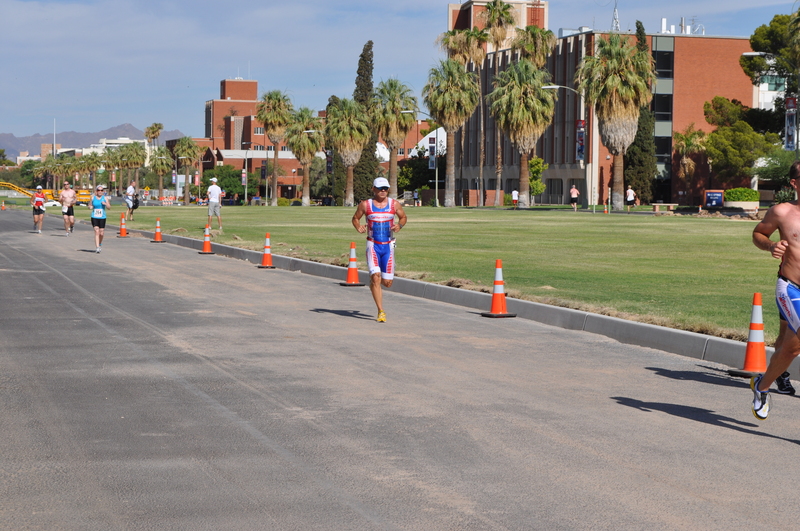 TriSports.com CEO Seton Claggett was 2 steps ahead of me starting his 2nd lap. I jumped on his heels since he was setting a good pace. He slowly pulled away from me but i was able to keep him close. We were closing the gap to the leaders. At the end of the loop they turned of for the finish line and I headed out for loop 2. With no more rabbits it was time to focus and maintain my pace. I continued to catch and pass the slower runners that had started before me. I tried to keep the pace high but the heat and humidity was trying it hardest to slow me. I still finished with a strong second loop though. Run split was 19:32…3 seconds slower than last year and 7th fastest of the day. Final time was 1:01:30…a 25 second improvement over last year and 7th place overall/1st place 45-49.